Purely in the aspect of ONBC research , Bix and I visited The Ginger Man Pub in Austin today. We felt a little field work was in order to get the proper perspective on the book. It is a very cozy place, lots of dark wood and conversational corners with comfortable couches and chairs as well as wooden tables and a nice patio in the back. 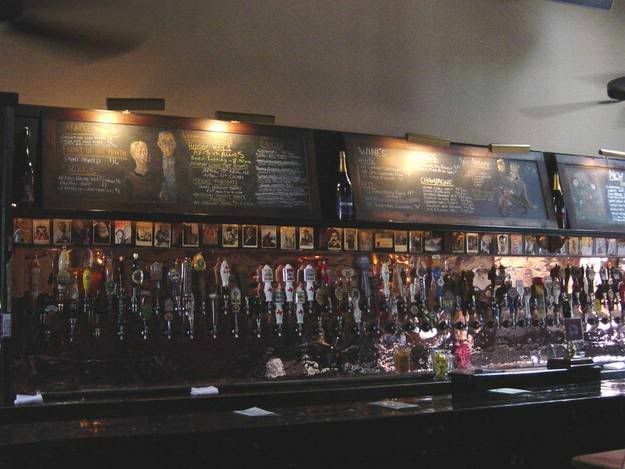 There is also a long bar on one side and on the back of the wall are all the taps for the draught beer. In the pictures you can see all the tap levers! The wall is polished copper and there was one poor lad who was polishing away while we were there. Quite a formidable task! There were also several of the old Guiness advertisements featuring animals but none of the kangaroo. I didn’t take too many pictures since there were other customers who probably didn’t want to end up on ONBC! Thanks for coming along, Bix! This was posted as a tidbit previously, but here is the link to all the Ginger Man Pubs. 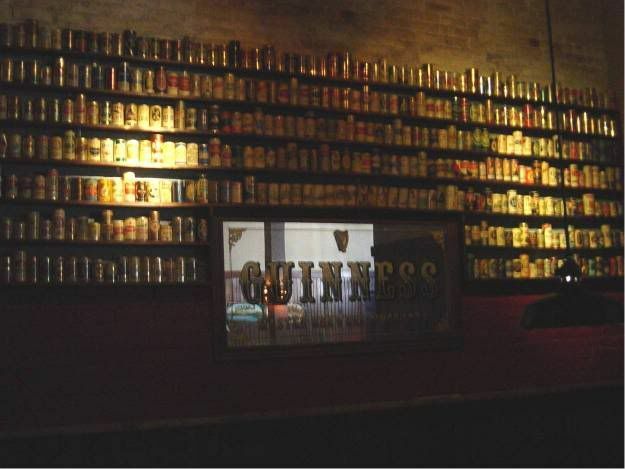 The wall behind the pool table…cans surround a Guinness mirror. Ineed, my dear, I enjoyed it very much! But I think we should go back when neither of us is the driver and there are more people there. It was a very comfortable place and I can see spending lots of hours discussing whatever ensconsed in those couches and easy chairs! They don't have very many Irish brews among their many choices, but DITHOT had a Harp and I had a Smithwicks (which the bar wench pronounced like Smittiks or some such?) which I enjoyed. So a good time was had by all! Wait...I'm confused...what is the tie in to the "Ginger Man" book? Is the whole bar concept based on this book? Coincidence? I think I'm out of the loop. 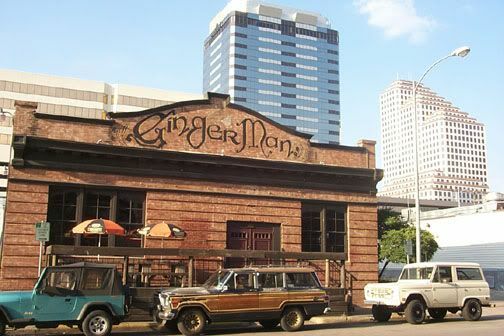 Charlene, see The Ginger Man Tidbit #11 for the history of the Ginger Man Pubs - 3 in TX and 1 in NY. And Donleavy himself was here in Austin in 1994. So DITHOT and Bix -- will you be taking a road trip to check out the other two pubs in Texas? If you head to the Houston pub, give me a call. Since I don't drink, I'll volunteer to be the designated driver for you two. Now come on,Bix and DITHOT..Any excuse for a drink I'm only kidding of course..How long did your research last? I'm curious about those chalk pictures,behind the bar.. I wonder if Johnny spent some time in the pub while he was shooting WEGG. Interesting drawings on the board behind the bar were they anyone specific could you make them out.And photos too I see. Are the chalk pics above the bar copies of famour pictures? The closest one looks very familiar, the puritan looking couple in front of a farm. I'm so glad that you got your research done - and absolutely essential! It looks a very atmospheric place. Thanks DITHOT and Bix for 'sacrificing' a Saturday afternoon in the name of 'research'. Looks like a great place to hang out. I enjoyed your report. That kind of research I'd do anytime! That's certainly my kind of field trip. I love all the cans with the Guinness sign. Bix and I were quite responsible in our research! Only one beer and a sandwich, anything for ONBC you know! Theresa if we make it down to Houston we just might need to do a bit more research! You can click on the first link to get to the web page for the Ginger Man in Austin. On the right is a button called “bar tour” with much better pictures than the ones I posted. GG, the Austin pub opened in 1994 so I suppose that would have been too early for Johnny to have visited during WEGG filming. Here is the one you are all referring to. If you click on the link below you can see examples of more. The art changes all the time depending on the occasion but the one of the couple and of the king are up now. There is also a row of photographs you referenced, GG. We looked for a pic of Mr. Donleavy but didn’t see one. So Johnny would no have been able to visit it while he was filming WEGG, perhaps he has visited it since. Gilbert's Girl wrote: So Johnny would no have been able to visit it while he was filming WEGG, perhaps he has visited it since. It wouldn't surprise me, GG. I would certainly love to run into him there!